5 Bedrooms - 5.5 Baths (Sleeps 12). 5 min walk to beaches and downtown. Newer home, built in 2005, with all the upgrades: granite counters, tiled baths, hardwood floors, new furnishings, air conditioning, outdoor shower, grilling deck, dining deck, and covered front porch. And of course, wireless internet. It has a very large yard for the Brant Point area that backs up to the wetlands. Jst a short walk to the heart of downtown Nantucket, Jetties beach, and the Brant Point lighthouse. This upside down home has four large bedrooms on the first floor each with en-suite full bathrooms. First Floor - has a master bedroom, a second bedroom with a queen bed, and two bedrooms with two twin beds each. All bedrooms have an ensuite bathroom. There is furnished covered front porch and a private outdoor shower. Second Floor - is a living room, dining room, kitchen, and enclosed office space. There is also a very large deck with two dining spaces on either end. The grill is centrally located. Third Flood - has the 2nd master bedroom with a king-size bed and an alcove with a double bed perfect for families with children. This home has it all, location, convenience, all the amenities you should expect for your Nantucket vacation. We have lived in the mountains of Colorado and Utah since the 70's but always searched for the perfect ocean getaway. We found it on Nantucket and Brant Point in particular. Both of our sons are skiers and surfers so our family has the best of both worlds here in Utah and Nantucket. I taught them to ski and they taught me to surf. We also love to fish, ride bikes, and paddle board. Our first vacation on Nantucket was in 1984 when our sons were just 1 and 4. Until we purchased our first home on Nantucket in 1996 we rented different homes from nearly one end of the island to the other. But we always gravitated back to Brant Point. You just cannot find a better location for a vacation on Nantucket for the convenience of being able to walk to shops, restaurants, beaches and the ferry, not to mention the 'Juice Bar' for that homemade ice cream. When we sold that first home we owned on the island in 2005 we bought our new home just 5 houses down the street. We just could not leave the island or Brant Point. Location, location, location. A short walk to great beaches, downtown, and all the restaurants, bars, shopping, and the best ice cream on the island at Juicebar. This home is great for large families or two families who want to vacation together. It's great for entertaining indoors and out. Lets make some memories! .5 miles from Jetties beach .3 miles from Children's beach. .5 miles from one of the best family beaches on Nantucket island. Wood burning fireplace, please be sure to open the flue if used. Parking for3-4 cars on gravel driveway off street. All towels for bath and beach provided. Gas range and electric oven. 4 slice toaster and a toaster oven. Fully equipped for all your cooking needs. In the TV cabinet in the first floor living room. Two large decks upstairs and on the first floor with seating and tables. There are stairs to enter the home. This house has everything you need for a great vacaton. This house was everything we expected and more, great layout, clean, well appointed and we could walk to town and the beaches! We rented this house for a girls weekend. I have rented many houses and this is, by far, one of the nicest. The house is HUGE! Great location. Owners were incredibly responsive and helpful. The house is incredibly well stocked. We have just returned from our stay on this property and would conclude that this was perhaps the finest vacation we have ever had. The house and grounds are superb, the location is private but easily accessible to town center shops, restraunts and all venues for sightseeing etc. The home is warm. inviting and extremely well furnished and appointed. In all we could not have been more pleased with the vacation we have just ended including our communications with the owner. We would most definitely recommend this house to anyone seeking the perfect setting on Nantucket and we will no doubt hope one day to return to our dream home away from home on Nantucket. Glad you enjoyed our home and the island. 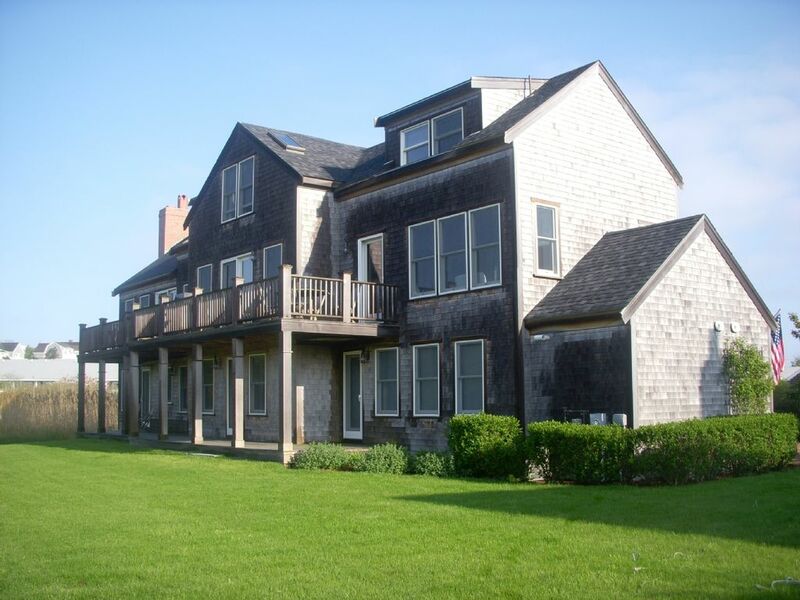 We are located in Brant Point, considered to be the best location for your vacation on Nantucket Island. Our location is great for a true family beach vacation you will never forget. Brant Point is close to all the downtown amenities from the Steam Authority and Hyline Ferry terminals, beaches, shops, bars and restaurants, grocery stores, liquor stores, and museums. For an ideal day at the beach, walk to Jetties where they have a playground, life guards on duty, restrooms, changing rooms, and a full restaurant bar called Sandbar. This is the most family friendly beach on the island close to your doorstep. We recommend catching the sunset and packing a picnic at Steps beach, or oysters at the Sandbar (their calamari is also worth trying)! For those with a sweet tooth, Nantucket Island’s best ice cream is 2 blocks away at The Juice Bar. Get the waffle cone, it’s worth it. They do special flavors daily so be on the lookout for something truly unique. And for those who are dairy free, not to worry, they have coconut based ice cream flavors daily. For those who like to be in the scene with waterfront dining, Cru is one of the best places to be. The lobster roll is unbeatable as is the people watching. If you want to have a cocktail on the sand try the Galley restaurant just down the street. For a more family dining environment try Brotherhood of Thieves. They have an excellent atmosphere, great food and drink so there’s something for everyone. Half a block away is the Island’s premier wine emporium called Epernay. The owners know their vintage and share their love for wine with frequent wine tastings, specials, and anything you could ask for in the realm of beverages. We have plenty of parking but a car is not needed while vacationing in Brand Point. If you want to travel around Nantucket island the bike baths are well maintained and there are a number of bike rental shops near our home. Cook's is just down the street. Once you wash the sand a salt off in the outdoor shower at the end of the day, all evening festivities are a short walk away from sunset to restaurants. If you are using a car we recommend leaving it at our home at night. You can easily walk to Jetties beach or Steps beach for the sunset, or downtown for food, drinks, shopping and all evening activities. Weekly rentals only with a Saturday to Saturday stay from June 15th to September 15th.